Chicago is known as a glorious city. They have all the good things and the bad. There are many Chicago attractions you can see on your Chicago trip. Things that range from fashion streets, to their zoo in the park, and spectacular museums. We will explore everything from vast towers, to wonderful parks, and the wild animals that may live in there as well. Chicago is known for their large and very tall buildings. Some of these buildings are not for businesses, but for visitors to come and shop, eat, and decks to enjoy the scenery. One of the most known buildings there is Sears Tower. When it was first built it was the tallest tower in the world. Today, it is the second tallest tower standing. The main attraction here is their Skydeck. It is a ledge off of the tower that is made of glass. It is at 1,353 FT in the air and offers you to see the whole city and beyond if you are brave enough to do it. The next best place to go to in Chicago is Navy Pier. This was first built as a shipping and entertainment pier in 1916. Today they offer a 148 ft tall Ferris wheel, as well as a carousel and a skyline stage. Other then rides you can enjoy museums for all ages as well as boats from the past that you can go aboard and see what it was like to be on them. The next best thing to see is Chicago parks. One of their most famous parks is the Grant Park. In 1836, before Chicago was even a place, this section of land made as a park. It has changed names over time but in 1901 changed to Grant Park after the 18th President. This place offers 300 acres to walk through. It takes you right by Lake Michigan, and even has the Art Institute of Chicago there. Enjoy many beautiful plants, statues like the Lincoln statue, and fountains. It is famous for the Buckingham Fountain, which at night will offer a wonderful light show to enjoy. The next best park is the Lincoln Park Zoo . This is one of the oldest free zoo’s still around today. Enjoy a walk in the park, and seeing over 80 species of animals for free. They have animals that range from Polar Bears, to Gorillas, and even Zebras. You can also enjoy many types of birds, reptiles like snakes, and even fish. With 1,200 acres to explore, you want to make sure you have plenty of time to enjoy it all. Outside of parks, and large towers and even zoos, there is still much to enjoy in Chicago. Many people enjoy going to the Chicago River, where they can enjoy a lavish boat ride and more. You also don’t want to miss out on the Field Museum. This place offers a large range of items such as cultural exhibits from Egypt, and Japan. They also have a natural exhibit where they have the largest and best preserved T-Rex ever. 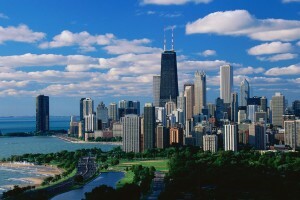 When you come to Chicago, you will have days upon days of things to do both for free, and some for a small fee. No matter what you choose to do on your time here, eat plenty of food, take lots of pictures, and remember that it is only a flight away for some, and only a drive away for others to come back and enjoy all that Chicago has to offer.